It’s been an extremely busy week in the talkhealth office, so we thought we’d tell you what we’ve been up to. Firstly, we’ve had two birthdays so lots of cake has been consumed! Helen, the youngest member of our team, had her birthday yesterday and brought in some cup cakes she’d made, and Deborah’s big birthday was on Monday. 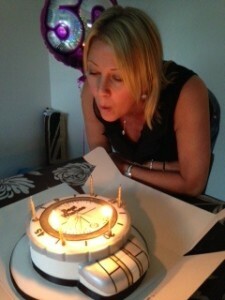 Deborah’s celebrations started last Saturday and are due to continue for the rest of this week. Well you only turn half a century once so we’ll let her off this time! Sonia’s been holiday in Germany but for various reasons, including work, flew back on Tuesday night and came back to work yesterday. Now that’s dedication! She’s with us until Friday then she jets back off to Germany to finish her holiday. Catriona is juicing! 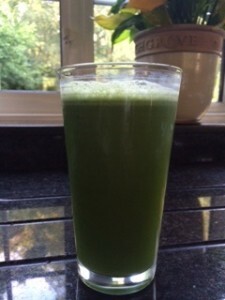 Clearly feeling guilty about all the cake she’s eaten this week, she made her first juice last night – and here it is! Anyone out there a juicer? If so, share your recipes with us as Helen also juices and we have a feeling Deborah and Sonia won’t be far behind. So have we been doing any work you may well ask? In between the celebrations, we’ve been extremely busy this week preparing for our next online clinic on skin conditions sponsored by Epaderm and Skinnies, and finalising our Sensitive Skin Twitter chat sponsored by Surcare. We’ve also starting to shape the online clinic on stress and anxiety at work for October, adding new articles to the site, creating surveys, choosing winners of our Aveeno Product Test and Avene Product Test, blogging, and talking with our visitors in the forums and via email etc etc etc! Next week is a short one with the UK August Bank Holiday on Monday. Let us know what you are planning – are you going away, going on day trips, exercising (think we need to after all that cake), or like us eating cake and celebrating birthdays and weddings etc. Whatever you are doing we hope you have a very enjoyable weekend.